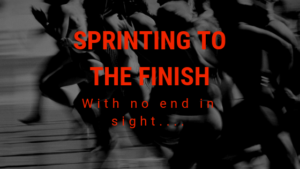 How much of your focus is on finishing strong in 2018? What impact does that have on your mindset and energy you take into 2019? Focus Leads to Success – so what we do through the end of the year will accelerate our sales and drive us to a record 2019!! Many business owners start talking about their focus and goals in 2019, which usually means they aren’t focused on the rest of this year. What if the focus and accountability for 2018 would help drive profits and business into their 2019 year? This strategy can be a huge missed opportunity to use these last few months of 2018 to tackle the tough stuff, stay focused on serving their clients and learning as much as they can about what their customers need. Many experienced salespeople, as well as business owners, know that how you finish the year will be an early indicator of your performance in the following year. Companies always set out goals for the year along with a strategic plan. What if you focused on them and how they are hitting or aligning to their goals for this year? Create and set the stage as a trusted advisor to your clients and show them you are there to help and support them. Anticipating the customers’ needs and being proactive. Become the go-to person they can rely on to provide advice or help as needed. Position yourself as their connector, introducing them to key contacts and helping them finish the year strong. Businesses and Sales Professionals need to understand that we can drive our own growth by focusing on our client’s success, helping them to build their business and finish 2018 strong. This will provide you a spot at the table and a solid working foundation to continue to support their business in 2019. At Keystone, we believe that To Grow Your Revenue you must Grow Your People and that your People are a primary factor in your growth and success. Keystone is committed to a partnership approach with customers, focusing on what drives bottom line revenue and setting the organization up for success. With the continued goal of helping first, making sure there is a true connection and the relationship will last for years to come. Connect with our team to find out more about our Business Growth Strategies, Leadership Development & Training, as well as Financial Strategies that can help drive YOUR businesses 2018 bottom line.